It is no coincidence that the great free-range egg-producing areas of the past were in relatively mild areas blessed with free-draining soils. The Lancashire sands and Wiltshire chalks were ideal, providing land free from boggy areas, although in very hot summers there could sometimes be problems of grass scorching in particularly thin-soiled areas. The ideal is to have adequate drainage to prevent waterlogging, while ensuring that the bulk content and fertility of the soil are sufficient to retain and provide enough water and nutrients for a healthy growth of grass. The balance is not always easy to achieve, but it is better to start with a well-drained soil than a heavy one. It is possible to improve drainage, but this can be an expensive option. Where the water table is naturally high, the only long-term solution may be to plough the whole area and excavate drainage ditches, as has been done in parts of the Fens. Such an exercise would not be cost-effective. It is possible to install permanent drain pipes – and this should certainly be the case in the area around a permanent house – but it is expensive for the rest of the land, and may also be difficult to justify in terms of the likely returns. In waterlogged areas, where the water table is not normally high, the problem may be one of ‘panning’. This occurs when the top few inches of a soil have become so compacted that the surface pan holds the water, without allowing it to drain through. It is usually clay soils which are affected in this way, although lighter soils may become panned if overuse has led to excessive compaction. The solution here is to mole plough the area. The ‘mole’ in question is a tractor attachment which breaks up the hard surface and forms a series of tunnels in the subsoil. There are agricultural contractors ho will undertake this. Once the area is ploughed, an application of lime in the autumn will help to flocculate the soil, the process by which tiny particles of clay clump together to make bigger particles, thus providing larger air spaces for more efficient drainage. The addition of nitrogen from a source such as calcified seaweed later in the season will increase the fertility while not creating a problem of leaching into the water courses. A new grass ley mixture can then be sown after the land has been harrowed and levelled. Once the grass has grown and established, it is ready to provide pasture for the birds. Where waterlogging is only apparent in small areas, the easiest solution is to dig a hole and place clinker at the bottom to make a soakaway. The point has been made elsewhere in this book that, where fixed houses are used, there should be a protected verandah to provide extra shelter, as well as a shingle or slatted area by the pop-holes to prevent muddy conditions. Some of the large free-range producers today are still not giving pasture rotation the importance it deserves. A common fallacy is the belief that a maximum of 1,000 birds per hectare is too light to cause damage to the turf, or to bring about a build-up of disease-causing organisms. The fact that commercial point of lay birds are inoculated against a wide range of diseases, and are kept for a shorter period of time than they were traditionally, does give them a degree of protection that flocks did not have in the past, but producers are wrong to rely entirely on these factors. A problem that I recently detected in some large units is that of ‘mole-hilling’. 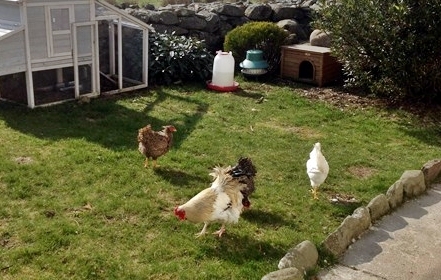 Here the birds scratch away the turf in order to make dust baths. This is entirely natural behaviour on the part of the hens, but where they are kept in large numbers on the same area of land, the density of dust baths can become so great that the pasture develops undulations. This, in turn, damages the shorter growing grasses needed by the birds, while allowing coarser grasses to gain a foothold. Once pasture has degenerated to this condition, it should be ploughed, rolled and harrowed ready for a new sowing, while the birds enjoy new ground. Widely recognised as the definitive guide to modern free-range poultry management, Free Range Poultry is a practical and comprehensive guide that is up to date with legislation and research findings. 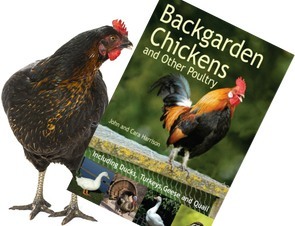 These articles on land management in free-range poultry systems are extracted from the book.